I are very excited to have this piece toured through Europe and extend my best wishes to the choir and its director, Dr. Lisette Canton. Meanwhile, I am working on a new large-scale composition for a cappella chorus tentatively titled “The Delights of Paradise“. 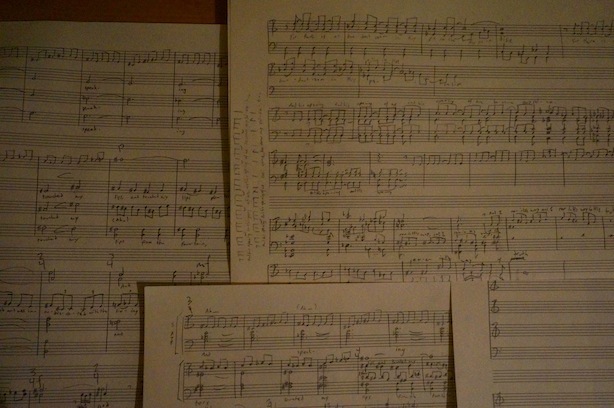 This work will be a seven-movement concert piece setting text from the Odes of Solomon. I have used text from this source on two previous occasions, including a piece I wrote for the Ottawa Bach Choir titled My Heart Was Cloven. This piece set is a setting of the first two verses of Ode 11; the new work will set the remaining 19 verses of the same ode. Sketches of the third movement.